Providing clarity to the question, How do I dispose of my needles? Nowadays, many patients are using injectable medicines and syringes at home. However, not every patient is aware of how to dispose of needles safely and effectively. Most users are tossing the needles, syringes and other medical wastes into dustbins or flushing them into toilets. Those methods are dangerous and incorrect practice of disposing self-injectors, these materials can pierce the skin of the sanitary workers and expose them to severe infections. Not only this, but such practices also risk injury and life-threatening infections to anyone encountering a used syringe, needle or other sharp in a park, on the ground or even at work. Shocked? The community-based programs render drop-off locations for used needles. These locations include hospitals, clinics, fire stations, police stations, physicians’ offices, health departments, or medical waste facilities. The very best example of this needle disposal program is Kiosk program. Under this program, electronic kiosks called “Zeedles” were placed in facilities to accept residential medical waste. Individuals can dispose their used needles and other involved equipment in these kiosks and get rid of the concern regarding where to dispose of needles and syringes (https://www.epa.gov/sites/production/files/2016-02/documents/med-govt_0.pdf). Under this category, special recycling containers are placed outside the home to be picked by trained waste workers on a schedule or on requested on-demand service. To have a look at what should be done regarding safe needle disposal, go through this link. Syringe exchange programs are usually run by non-profit groups whose primary aim is to make people aware of HIV, AIDS and other such diseases. These programs allow drug users to exchange used needles and syringes for the new ones. The collected used needles are then disposed of at a medical waste collection site. Hazardous waste collection sites act in the same manner as the recycling centers do. They place medical waste collection containers at designated places where people can come and empty their needle disposal containers. 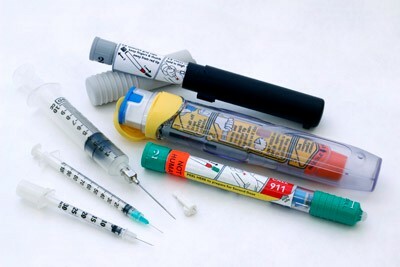 Another safe needle disposal method for self-injectors is the application of needle destruction devices. These devices can bend, break or shear the needle, minimizing the risk of infection with the needle. However, the problem of where and how to dispose of needles remains with this mechanism. Moreover, this solution does not work for lancets. In Mail-Back programs, a regulated needle disposal container is shipped to your home, and returned via mail once it has been filed. 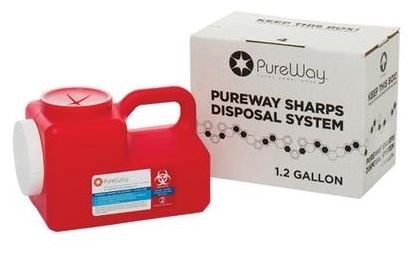 Needle ship back systems are preferred over all other options because a mail back program provides a OSHA approved sharps container, like a 1.2 gallon PureWay Sharps Disposal System, which will safely container all sharps and needles and then safely ship the used needles to a licensed treatment facility for the waste to be properly disposed and recycled. In order to decide which sharps disposal method is best for you, consider your needs. If you require long-term treatment for HIV, diabetes and other chronic conditions, going with larger mail back system like a 3 gallon is the optimal. Whereas, if you are supposed to take injections for a short period of time, a smaller mail-back option such as a 1.4 quart PureWay mail back or 1.2 gallon mail back is the right choice. Now that you have learned several different methods of how to dispose of needles, your next question might be where to find mail-back programs. PureWay compliance is a convenient, eco-friendly and cost-effective solution to you waste disposal. For further assistance or to order your mail back solution, contact PureWay Compliance at 1-877-765-3030.